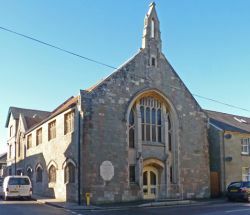 Bell Street United Church is a Local Ecumenical Partnership created in January 2001 between the Methodist Church and the United Reformed Church meeting on the Methodist Church premises. The United Reformed Church were the descendents of the original nonconformists in the reign of Henry VIII. A Presbyterian Meeting House was built in nearby Muston’s Lane in 1670. In 1715 it became Congregational. The Meeting House was rebuilt in 1859 and finally closed in 2001. The Methodist Chapel was built, in 1766, on the site of St Laurence’s Church, a medieval parish church. Rebuilt in 1827, it had galleries installed in 1864. In 1907 it was again rebuilt and became the Charles Garrett Memorial chapel. In 2007 we remembered all who contributed to the life of the Church over the years as we celebrated the centenary of the present building, which coincided with the completion of an internal refurbishment to the church. Bell Street is a lively, Spirit-filled Church whose aim is to draw nearer to God through worship, Bible Study, small group fellowship, social events and reaching out into the community. As we know God better, we learn what he wants us to do here and in His wider world. Our hope and prayer is that others will begin to share the love and work of Jesus which we are so privileged to experience; that they too may find and respond to Jesus in the power of the Holy Spirit.